Ryan Homes, one of the nation’s largest homebuilding and mortgage banking companies, announces the grand opening of its new Courtland Gate single-family model home at The Colonies at Powhatan in Williamsburg, Virginia. Built by NVR’s Ryan Homes division, The Colonies at Powhatan is a luxurious collection of estate-style homes in the heart of Williamsburg. The new homes at the Colonies at Powhatan are priced from the upper $460,000s. The Colonies at Powhatan community offers a comfortable lifestyle with a wide range of amenities right on site. The impressive estate homes are set on expansive wooded homesites with graceful cul-de-sac streets that create a sense of seclusion. Elegant details including brick exteriors and architectural shingles add classic elegance to the community. Interiors feature top finishes such as granite countertops and upgraded cabinetry and trim. Residents will enjoy a neighborhood clubhouse, a swimming pool, a playground and a large community lake. Shopping and dining are close by at Monticello and Windsor Meade Marketplace. The Williamsburg area is known for its beautiful golf courses, historic sites, Colonial Williamsburg and Busch Gardens. Homeowners at The Colonies at Powhatan will have a multitude of professional opportunities in education, defense and entertainment. The College of William and Mary is just a few miles away, and major Virginia cities of Newport News, Virginia Beach and Richmond are easily reached. The stately Courtland Gate model offers 4+ bedrooms, 2+ baths and 2,900+ square feet of living space. Enter through the dramatic two-story foyer and find a formal living room and dining room which can be accented with optional columns. Tucked away behind double doors is a secluded study that can be used as a convenient home office. The center island kitchen offers a functional pantry, and the adjacent dinette flows seamlessly into the expansive family room. For even more space, homebuyers may add a sunny morning room and a family room extension. A mud room leads to the 2-car garage. Upstairs are 4 bedrooms, including a huge owner’s suite which may be customized with a personal sitting area. This lavish retreat offers a large walk-in closet and a dual sink vanity and separate soaking tub and shower in the bath. An additional full bath serves the other 3 bedrooms. There is also a upper-level laundry room, and the basement may be finished with a media room, exercise room and powder room. Like all new Ryan homes, those at The Colonies at Powhatan are fully ENERGY STAR® Certified, yielding monthly utility bills up to 30% lower than standard homes, according to the EPA. All Ryan homes carry 10-year structural warranties, and are independently verified for quality by a third-party inspection company. 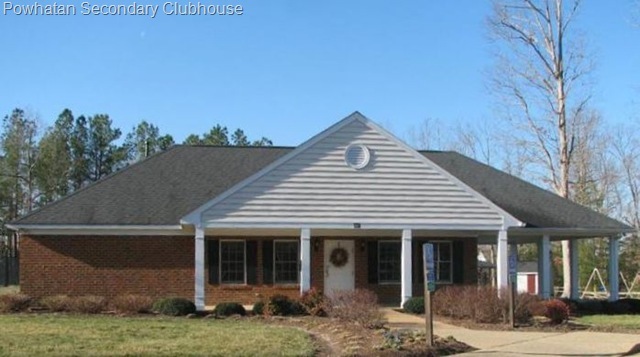 A Master Planned Community Powhatan Secondary offers a wide range of custom built resale homes Located in James City County/Williamsburg, Virginia. Nearby are the the shopping districts of Monticello Marketplace and New Town. The combination of which offers almost any store, business or restaurant. From Ukrops Grocery to Target to Trader Joes to Bonefish Grill, Barnes and Noble, Opus Nine. The list of stores is endless. 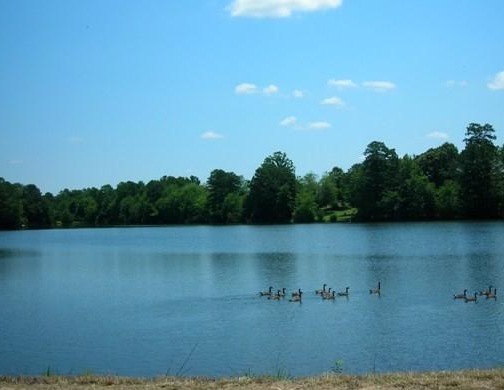 Mid County Park and Kidsburg is located just beyond Powhatan Secondary and offers an amazing playground complete with picnic areas. If golf peaks your interest, Williamsburg National and Fords Colony are challenging local golf courses nearby. 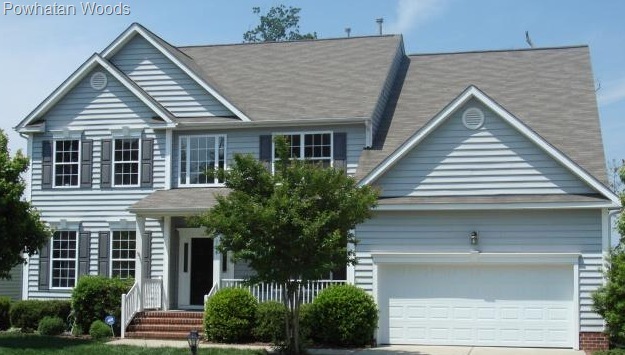 Nestled among the rolling hills of James City County and just a few minutes drive from Colonial Williamsburg, Powhatan Secondary is a collection of custom built single family homes, cluster homes, townhouses, condominiums, and apartments. The various neighborhoods within Powhatan Secondary offer a unique section of housing. These communities include the attached and detached neighborhoods of Wythe, Essex, Sussex, Cluster Village, Westover, Berkeley, Waterford, Cromwell Ridge, Powhatan Woods, Powhatan Place, Village of Powhatan and The Colonies. 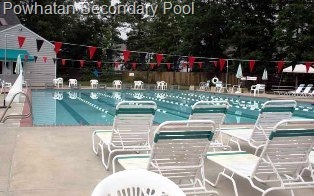 The community is surrounded by scenic lakes and a 4.3 acre recreation site complete with clubhouse, swimming pool, basketball court and playground for all residents to enjoy. Living in rural areas of Williamsburg allows you the luxury of activities like sailing on the James River, or just enjoying the peaceful nights and quiet surroundings. However, you can still sink your toes in the sandy beaches nearby. The Virginia Beach Ocean front is only 45 minutes away offering well groomed beaches, nightclubs, fine dining and dolphin watch cruises. 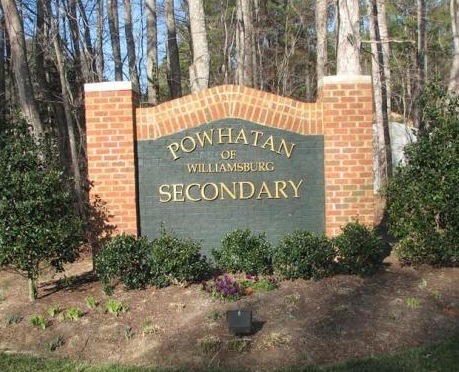 For those interested in history, when Powhatan Secondary was conceived the Developer wanted to associate it with the Williamsburg name ,even though it was not within the City limits of Williamsburg . Thus, they named the development POWHATAN of WILLIAMSBURG SECONDARY (similar to the system of "primary" roads and "secondary" roads). Over time, that title has been shortened to the current "Powhatan Secondary". The Powhatan name comes from the indian tribe formerly residing in the area. 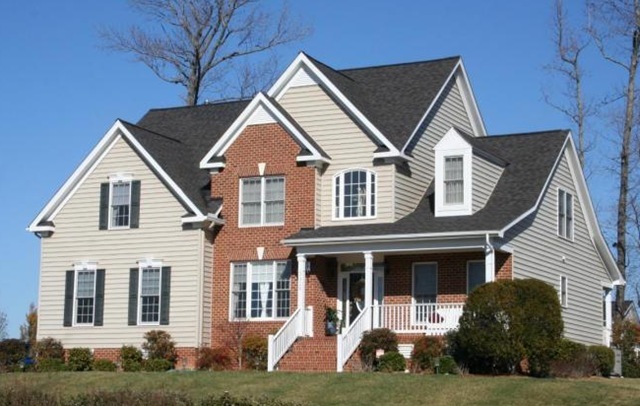 Detached and attached homes offered in Powhatan Secondary in Williamsburg, James City County, VA offer a wide array of architectural styles and home choices. From 2 bedrooms to 5+ bedroom models. Square footages range from 2000+ to over 5000 square feet. Most homes were built starting around 2000- present day. There are still new homes being built in Powhatan Secondary. The annual home owner dues are $180 (except for residents of Cluster Way who are billed an additional $111 per year to pay for private street lights and escrow funds for private street maintenance). he year 2000. Villages at Powhatan Secondary, Townhomes, Williamsburg, Va. 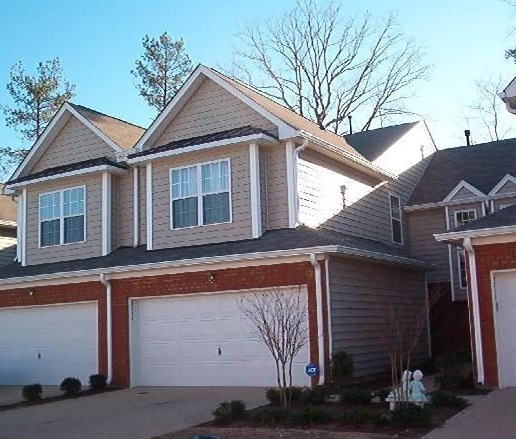 Villages of Powhatan is a town home community located within the Powhatan Secondary neighborhood. Home Owner Fees here are $126 monthly which includes all Yard Maintenance, Common Area Maintenance, Garbage Removal, Exterior Building Maintenance and Property Management .The townhomes at the Villages at Powhatan Secondary offer unique design and architecture with open floor plans, high ceilings, and colonial details. These townhomes offer 2 to 4 bedrooms, 2 to 3 bathrooms, a 2-car garage, with 1,800 to 2,000 sq. ft. of living area. Most townhomes in Villages of Powhatan offer semi-private driveways, fenced backyards, and prices beginning in the mid $200’s. Powhatan Place townhomes overlook a beautiful tree-lined lake in the heart of Powhatan Secondary. Offering 3 and 4 bedrooms designs with either 1 or 2 car garages, Powhatan Place provides open floor plans with cathedral ceilings, large family and formal dining rooms, oversized bedrooms, walk-in closets, and gas fireplaces. 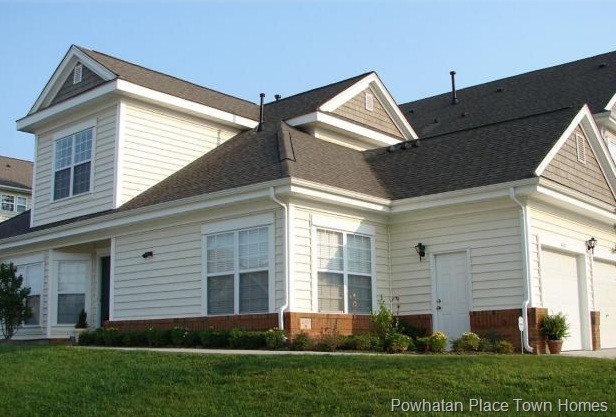 Powhatan Place is Town homes start in the high $200’s. Homeowner Fees in Powhatan Place are $180 a month which includes all Yard Maintenance, Common Area Maintenance, Garbage Removal, Exterior Building Maintenance and Property Management . Sale prices ( of detached homes) for the last 12 months in Powhatan Secondary ranged from$350,000 to $725,000. 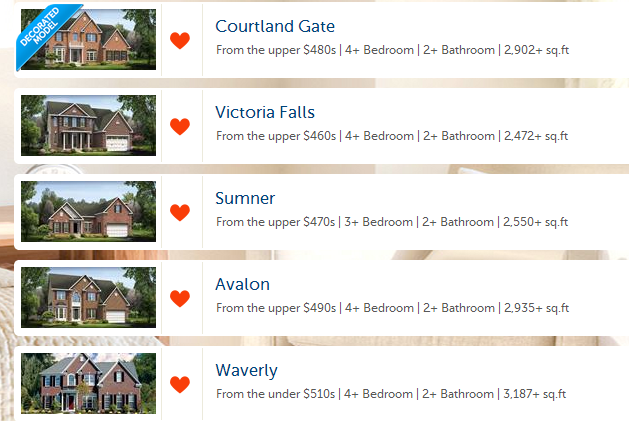 List prices as of today range from $335,000 to $669,000. The average days on market for homes in Powhatan Secondary in the last 12 months was 135 days . 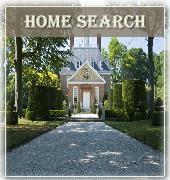 The average price per square foot on homes sold in Powhatan Secondary in the last 12 months was $142.85 . 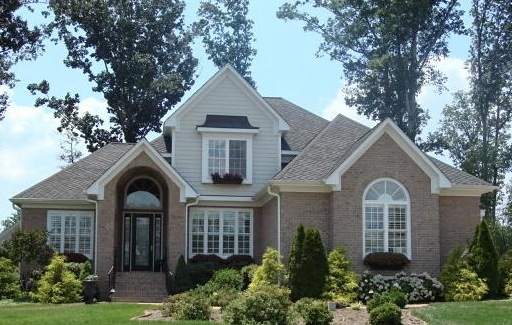 20 homes sold in Powhatan Secondary in the last 12 months. 18 are currently for sale.